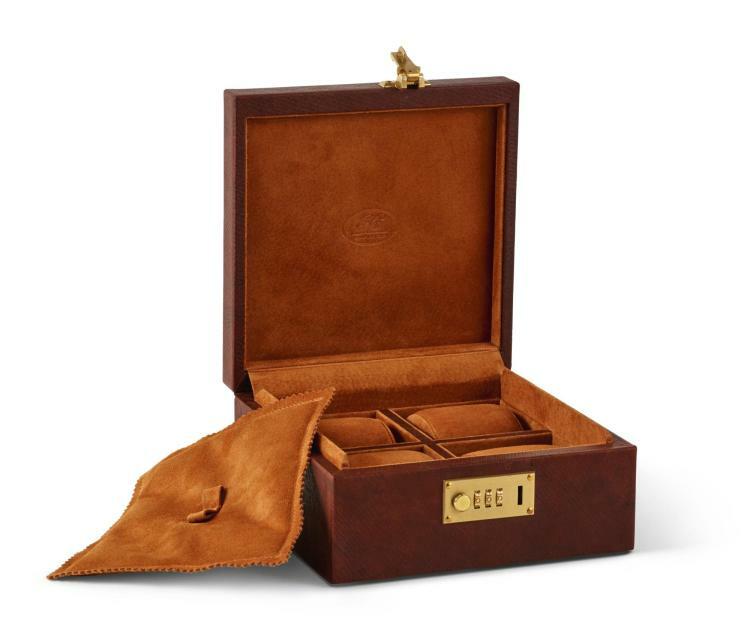 Description: George Cleverley has given the Huntsman treatment to this exclusive Russian deerskin leather covered watch box, made to house four watches. In 1973, divers off England’s Plymouth Sound found the wreck of an eighteenth century brigantine that sank in 1786 with a cargo of reindeer hides. These had been cured in baths of rye or oat flour and yeast, hand embossed with a varied cross-hatching before being soaked in wood liquor, hand curried, and then soaked in seal oil and birch tan oil. This leather is literally a piece of history, and once it is gone, it is gone forever. Many Huntsman clients choose Cleverley bespoke shoes, especially those enjoying having their suits cut by co-head cutter Dario Carnera whose father John recently retired from the Cleverley partnership.